Hunting dogs, it seems, like nothing better than tracking down game such as a pheasant, retrieving it with a soft mouth and obediently laying it at the feet of their owners. But hunting and fetching are two different activities! Other dogs love to fetch — almost as much as they adore the ensuing game of keep-away as they orbit around their owners, refusing to give up the tennis ball. Are there certain breeds that are better than others at hunting? And how does a great hunting dog become one? Hunting dogs generally fall into three categories: gun dogs, hounds and terriers. If you want a dog to track, point, flush and retrieve birds or small game, consider a gun dog. Labrador retrievers are probably the most popular type of gun dog and often have the ability to remember where birds land so they can easily retrieve them later. Other types of gun dogs include golden or Chesapeake Bay retrievers, Brittany or springer spaniels, German shorthair pointers, English setters and Portuguese water dogs. Hounds channel their noses or eyes to track large game such as deer or bear. Scenthounds include breeds such as coonhounds, foxhounds and beagles, and are more commonly used to hunt than sighthounds such as greyhounds. Finally, high-energy terriers like to chase after small game such as squirrels and even dig into tunnels in pursuit of their targets. Examples of this hunting category include Jack Russell terriers and wire fox terriers. Most of all, you’ll need a dog that’s physically capable of keeping up with fast-moving game and has the stamina to track for hours at a time. That means bulldogs are probably not your best bet. Some breeds are just born with physical attributes that help them be good hunters. Labrador retrievers, for example, have webbed paws and a thick tail that acts as a rudder when retrieving fowl in the water. If you’re a serious hunter and plan to spend a lot of time in the field, it’s worth it to find a reputable breeder who is devoted to raising hunting dogs. These people will typically breed for pups without orthopedic problems such as hip dysplasia that could shorten their hunting lives. You’ll want a dog with a good temperament that can work at your side in the fields but be a good family dog as well. Of course, obedience goes without saying. Positive-reinforcement training should start at eight weeks so your pup learns basic commands such as sit, stay, come, fetch, heel and drop it before he or she advances to scent tracking and soft mouth skills. Some dogs have a fear of loud noises such as fireworks, thunder and, unfortunately, gunfire. Part of training your dog might include trips to a target-shooting facility to make sure the sound won’t upset your pup. The best way to prepare your dog for a day in the fields is to keep exercising and training all year long. That way, he or she will be in peak condition when you hit the ground. Before heading into the field, your dog may benefit from a grooming session to remove longer fur (including on the tail) that can collect burrs or get tangled in the underbrush. Trim nails so they don’t snag on roots or rocks. 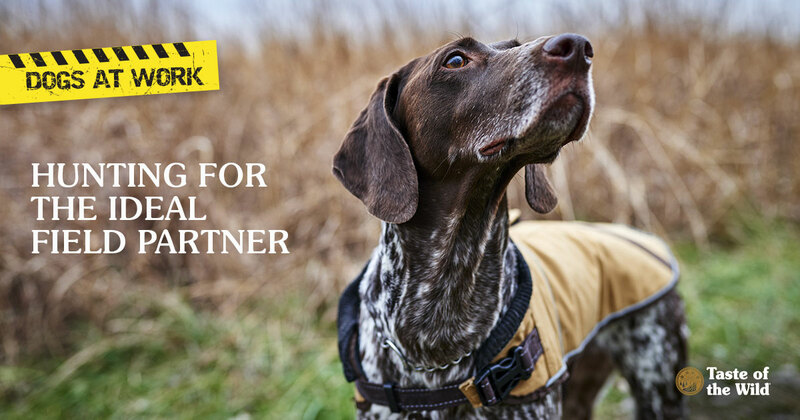 A comfortable hunting vest that protects the chest and belly can help prevent branches and thorns from scratching your dog’s skin raw. If it’s waterproof, all the better for diving into lakes and streams in search of game. Don’t forget to bring fresh drinking water and extra dog food to help sustain your dog’s energy during the day. Even if you don’t bag the limit, just being in the outdoors with your best friend makes for a great day.